Notwithstanding the name, Peace & Plenty cost me some nerves—no peace, but plenty of waste fabric. And all this solely because I wanted to save time, some cutting, and thread. Technically, this block consists of 32 half square triangles. But since 16 of them meet with the same colour/print, I decided to take a shortcut there. Which meant I would neither use Laurie’s templates, nor paper piece the block. Instead I wanted to figure out what size I had to cut my squares in order to get the four quarter square triangles you can see in the middle.—And I simply couldn’t. I measured, and calculated, and read tips on the internet—but no, it would not work out. 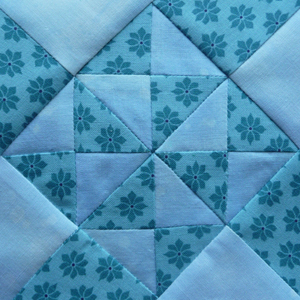 I will not write down how I finally succeeded in sewing the block you can see above. I am neither proud of it, nor did I save any fabric, thread, or time, as a matter of fact. But up to now, I can dispose of two ugly blocks, one oversized block, and some small quarter square triangle blocks, and now am playing with the thought of sewing them into a “quilt of failures” in the end, since I am sure, I will add to their number in time. Posted in Uncategorized and tagged farmer's wife, farmer’s wife quilt, peace and plenty, peace and plenty block, quilt, quilt block. Bookmark the permalink.